Middle school students about the Spirit of Bermuda prepare to go snorkeling. The Bermuda Sloop Foundation recognizes that children learn differently, and many of Bermuda’s youths do not acquire information optimally in a traditional classroom setting. 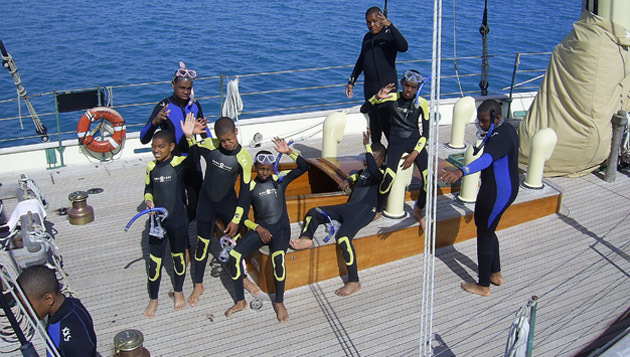 Aboard their floating classroom, Spirit of Bermuda, they provide character and educational development for these and other Bermuda youth using the unique attributes of structured experiential learning through sail training (learning by doing). Since 2009 BIOS has been providing snorkel training and in-water science experience to participants in the Middle School Learning Expeditions, picking them up in one of BIOS's boats and spending an afternoon sharing information about Bermuda’s marine environment, as well as the importance of environmental responsibility and stewardship. In 2013, BIOS and Bermuda Sloop Foundation decided to expand upon their collaboration by starting a scholarship program for Spirit participants to attend BIOS’s Ocean Academy. To learn more about the Bermuda Sloop Foundation, please visit their website.